I know many of you have replaced the port lights (windows). 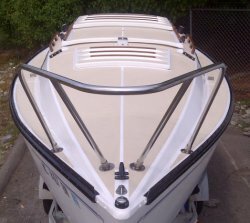 I am about to do the same, and I need to order the acrylic prior to removing the port lights since the boat is outside in the weather. This is my question: Is the window cut out on the outside of the boat the same dimensions as the cut out on the inside? 1976 Chrysler 22 "Blues Image"
Also if you are re-using the original frames (assuming the C22 is the same as the C26), go slow removing the outer frame; they bend easily and are hard to get back exactly flat. I found on EE's it was best to use as wide a putty knife/tool as you could to spread the load along the edges.. Thank you for the replies. I don't plan to use the original frame, but rather use the 3M VHB tape method. I hope to make some mahogany trim for the inside. I've thought long and hard about Wiley windows, but that would necessitate filling the gap between the hull and inner liner with epoxy and wrapping fiberglass cloth on all the edges along with sloping the bottom edge so the water can drain. Too much work for me right now, even though opening ports would be nice. My original port lights are crazed and scratched, so I plan on replacing them with dark smoke acrylic material. Another question, how thick is the original plexiglass? 1/8" ? Last edited by gregcrawford on Wed Sep 12, 2018 10:34 am, edited 1 time in total. But, per your suggestion, I will attempt to remove the outer frames carefully. Someone else may need them at some point. 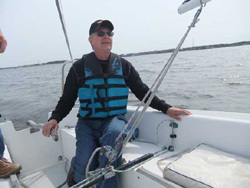 C22 Bob, didn't I give you the mast hook from my boat after I installed a mast hinge? Or was that someone else? I took Blues Image to the Outer Banks several years ago, and I hope to take her to the Dry Tortugas in the spring. After that, I'll probably put her up for sale. Good luck on the project. I replaced my portlights last year with Lewmars and used the 3M double foam tape for making the outer seal. Worked great..
Greg, here is my 15 minute video on how I replaced the windows.